Visitors line up along the bar inside Fritz Snitzler’s Saloon waiting for a cold bottle of sarsaparilla. The most eager are those who can barely reach the top of the massive wood structure. While in line, they listen to a saloon girl in full costume tell them to expect their soft drink to taste a bit like root beer and that just like on today’s warm afternoon, saloons in the late 1800s were popular places in Wichita. The saloon, named for a German immigrant who was one of Wichita’s earliest business owners, is one of 54 historic and recreated buildings at Old Cowtown Museum that help tell the story of what life was like just off the Chisholm Trail during the 1865-1880 timeframe. The 1885 building is among 27 originals at the museum, including Wichita’s oldest surviving structure (the 1868 Munger House) and one of the top 10 intact structures in the United States (the 1870s Heller Cabin). Each structure contains period-appropriate textiles, furnishings, tools, and art from the museum’s 10,000-piece permanent artifact collection. 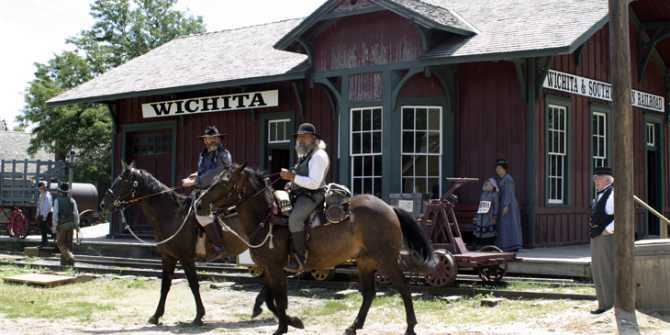 While the buildings and artifacts create the backdrop, the museum’s costumed interpreters, daily activities, education programs, and special events bring to life the stories of Wichita’s transformation from a frontier settlement to a cattle town to an agricultural and manufacturing area. Here are the 2018 season’s special events, all of which are included in regular admission to Cowtown. Note that admission to Cowtown is free on Sundays from April 8 through Oct. 21 thanks to a community benefactor. Additionally, as a Blue Star Museum, Cowtown offers free regular admission to active-duty military and their families, including National Guard and Reserve, from Memorial Day to Labor Day.